L'il Critters™ Fiber Gummy Bears is a great way to support your child's digestive system with 3 grams of fiber in every delicious gummy serving;* that's more fiber than in 1 cup of asparagus! 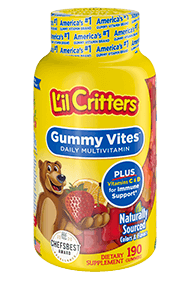 L'il Critters™ Fiber Gummy Bears are also sugar free. Did you know? - One serving of L'il Critters™ Fiber Gummy Bears has as much fiber as four prunes. Naturally sourced berry, strawberry, and lemon flavors.